To add a discriminator output to the AOR AR8000 (AOR8000), you have to disassemble the middle circuit board of the scanner. This is not too difficult. Open the scanner by removing the two screws in the battery compartiment and the two small screws on the side. If you open the scanner, you look at the top of the middle PCB. The discriminator IC is on the bottom side. 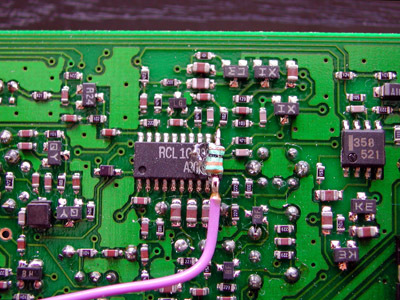 To disassemble the board, remove the two screws at the bottom end of the PCB. Remove the volume, squelch and dial knobs and loosen the washers with a pair of fine tip pliers. Now you can take apart the PCB. Be careful not to bend the two pins of the battery connectors. The discriminator output is made on pin 11 of the discriminator-IC, a 10489. One lead of a 'safety resistor' of 10 k (the exact value is not critical, I use values between 5,6 and 15 k) is bent to follow the IC's pin exactly. 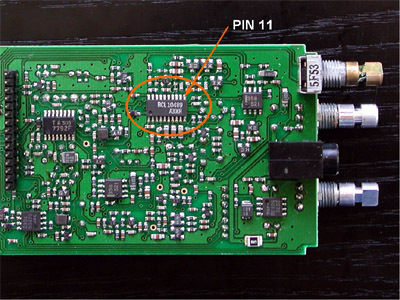 Then, the resistor is connected to pin 11 of the IC using a fine tip soldering iron and a minimum amount of solder. The resistor is fixed to the IC with a drop of glue from a glue gun. This prevents damage to the IC pin when inadvertedly mechanical stress is applied to the resistor. To the other side of the resistor, I connected a small piece of insulated wire, which leads to the 3.5 mm chassis terminal. It's not very long, and runs between two PCB's, so it's not necessary to use shielded cable. I mounted the 3.5 mm chassis terminal in the other part of the scanner. 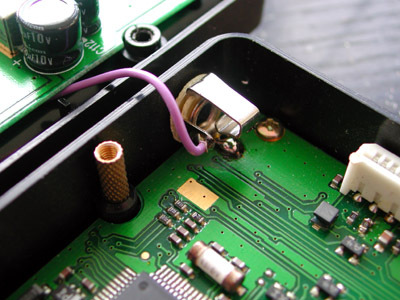 The terminal's ground lug is connected directly to the PCB's ground. You have to scratch a bit of the protective coating off before soldering.